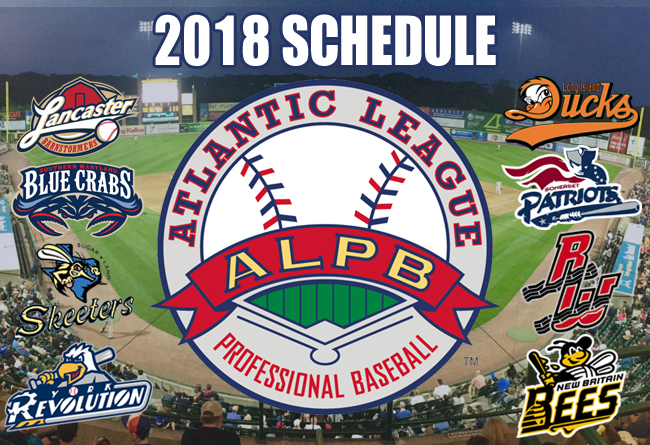 (Lancaster, Pa., Oct. 23, 2017) – The Atlantic League of Professional Baseball (ALPB) today announced its Championship Season Schedule for 2018. The league’s 21st season of play will feature eight member clubs: the Long Island Ducks, New Britain Bees, Road Warriors and Somerset Patriots in the Liberty Division; and the Lancaster Barnstormers, Southern Maryland Blue Crabs, Sugar Land Skeeters and York Revolution in the Freedom Division. The 2018 season will feature a 126-game schedule that begins on Thursday, April 26. Opening Day will feature the defending Atlantic League champion Revolution hosting their championship ring and banner raising ceremony at PeoplesBank Park against the rival Barnstormers. The league’s other six teams will begin play on Friday, April 27 with the two-time defending Liberty Division champion Ducks visiting the Blue Crabs, the Skeeters hosting the Bees and the Patriots welcoming in the Road Warriors. The Road Warriors will enjoy the distinction of playing each of their games on the road. The league has utilized the Road Warriors in a number of seasons past, most recently in 2011. The League expects to return to a full complement of eight home communities in 2019. The 21st Annual Atlantic League All-Star Game will take place on Wednesday, July 11. This year’s midsummer classic will be hosted by Long Island at Bethpage Ballpark in Central Islip, N.Y. 2018 marks the third time the Ducks will host the All-Star Game, previously doing so in 2002 and 2010. The ALPB schedule is divided into two 63-game halves, with the first half ending on Thursday, July 5 and the regular season ending on Sunday, September 16. The first half and second half champions in each division will qualify for 2018 Atlantic League playoffs. Should one or both teams win each half in their respective division, a wild card scenario comes into play where the team(s) with the next best overall record, regardless of division, qualifies for the postseason. Both Division Championship Series matchups will take place the week of September 17, with the Atlantic League Championship Series occurring during the week of September 24. To view each club’s 2018 regular season schedule, please visit their respective websites.